The Ohio State women’s hockey team is ready to prove that last year’s Frozen Four run was no fluke. The No. 7 Buckeyes (14-6, 8-4 Big Ten) will try to steal a win against No. 1 Wisconsin (19-1, 9-1 Big Ten) as they begin a home series against the Badgers on Friday. Ohio State will face a Wisconsin offense that is No. 2 in the country in goals and No. 1 in scoring margin. With the Badgers entering the weekend on an 11-game winning streak, the Buckeyes’ interim associate head coach Andrew Cassels said the series will test his team’s mettle. Ohio State is no stranger to defeating the Badgers. The Buckeyes claimed victories in their past two matchups against the Big Ten rival last year in February. Cassels emphasized Wisconsin’s speed and said that blocking shots will be key to neutralizing its prolific offense, encouraging his team to get into shooting lanes and making sure the Badgers cannot easily get shots off. 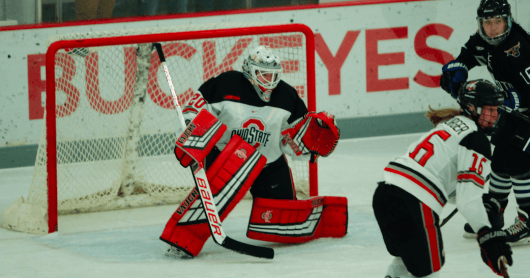 Coming on the heels of a three-game win streak, Ohio State’s standout freshman goalie Andrea Braendli said the Buckeyes don’t have many adjustments to make. Braendli, who is No. 8 in the nation with a .939 save percentage, said playing a highly touted conference rival such as Wisconsin provokes a higher sense of anticipation from the team, bringing an excitement to the Ohio State locker room ahead of the weekend. But Ohio State redshirt junior defenseman Jincy Dunne thinks it brings a higher expectation for the team, saying the Buckeyes defense will have to be aggressive in front of Braendli against the creative Wisconsin lines. With Wisconsin outscoring opponents 81-23 on the season, Dunne said the Badgers defense has yet to face the type of challenge that the Buckeyes can give them. Dunne stressed the impact a series victory against the Badgers could have on the national perception of the Buckeyes. “It would be huge for us to get up in those rankings and show that the Frozen Four wasn’t a mishap,” Dunne said. The Buckeyes face Wisconsin in Columbus at 6:07 p.m. Friday at the OSU Ice Rink and again at 3:07 p.m. Saturday.